The Renaissance city of Florence is among must-sees on every Italian itinerary. Located on River Arno, which divides Florence into two parts, the city is the capital of Tuscany and one of the top cultural destinations in Europe. Renowned museums, such as the Uffizi and Accademia, exhibit famous art pieces. Also, Florence boasts incredible architecture, epitomized by the sky-soaring Duomo and the Palazzo Vecchio. Furthermore, the city used to be a place where some of the greatest masterminds in history, Michelangelo and Da Vinci in particular, lived and created. What we mentioned so far is only the beginning. Florence offers much more in terms of sightseeing to keep you occupied for weeks. Aware that most people don’t have that much time, we have come up with the option that allows you to organize your itinerary while achieving savings and getting the best value for money. Florence hop on hop off bus tours take you to key attractions of the Renaissance city, allowing you utmost flexibility along the way. With passes that are valid between one and three days, you save money and time, get an overview of Florence in various languages and cover the essential in an efficient manner. Line A: Every hour from 9.00 to 16.30 from November to March. Every 15 minutes from 9.00 to 18.00 from April to September. Line B: At 10.35, 12.35 and 14.35 from November to March. Every 30 minutes from April to October. We are comparing Florence Hop on Hop Off Bus Tour Prices from leading ticket suppliers and Try to find you Cheap tickets prices on the market. 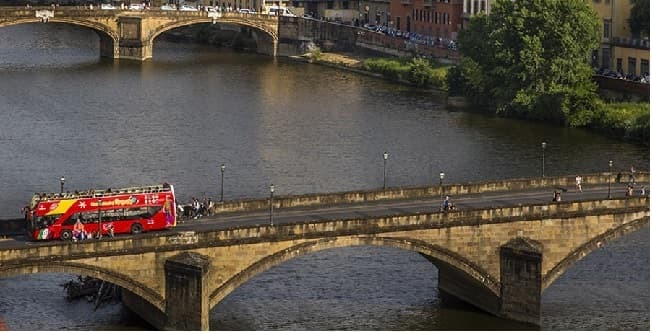 Make sightseeing in Florence an efficient, comfortable and enjoyable experience with a Hop-On Hop-Off Bus pass, giving you access to any of the ‘Big Red Buses' across the city centre. With two lines traversing the city, with a total of 44 stops where you can climb aboard or disembark, this pass gives you the flexibility to explore the city at your own pace. The Hop-On Hop-Off bus is a convenient option for wheelchair users to see the city, as well as families. Keep the kids entertained with the multilingual audio commentary and sit back to enjoy fantastic city panoramas from the open rooftop. Save time and travel stress-free with a 24, 48 or 72-hour pass. It couldn't be simpler to use, after collecting your ticket from the visitor office in Santa Maria Novella train station just head to any of the marked stops and hop on the next bus. The entire loop takes 60 minutes (Line A) or 120 minutes (Line B) but you're free to jump off at any time, each of the Hop-On Hop-Off bus stops are located by top museums and attractions. If you are a spontaneous traveller who would appreciate the freedom of being able to leave a tour when it suits you and re-join later, then this is the right tour for you. Very useful for families with children, disabled visitors and seniors. 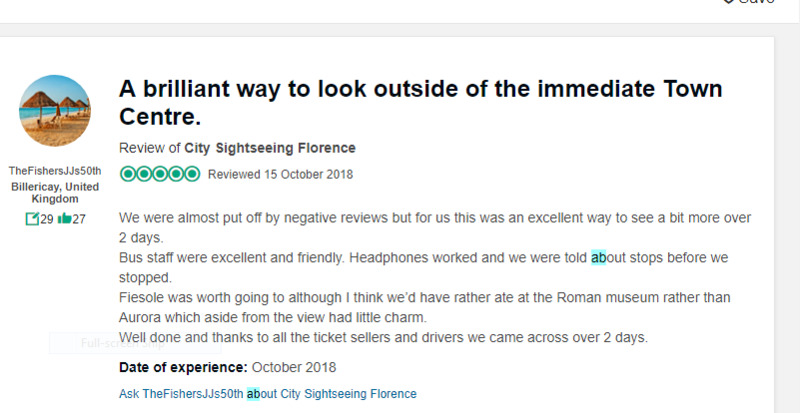 Your Experience With Florence Hop on Hop Off Bus Tour? Enjoy convenient and reliable transport around Florence with a 24, 48 or 72 hour pass. Make your own itinerary and travel stress free to all of the city's top landmarks and attractions. Learn about the historical and modern facts of Florence with an onboard audio commentary available in 8 languages and benefit from free wifi on all Florence Hop-On Hop-Off sightseeing buses. What Florence Hop on Hop Off Bus Tour Includes? 24, 48 or 72 hour ticket (as selected) for Florence Hop-On Hop-Off sightseeing bus. Onboard commentary in English, Italian, Spanish, Portuguese, French, German, Russian and Japanese. Line A (1 hour, 17 stops): Santa Lucia, Ognissanti, Guicciardini, Frescobaldi, Pitti, Calza, Villa Cora, Galileo, Michel Angelo, Ferrucci, P Giraldi, Teatro Verdi, Santa Croce, Bessaria, Donatello, Liberta, Central Station. 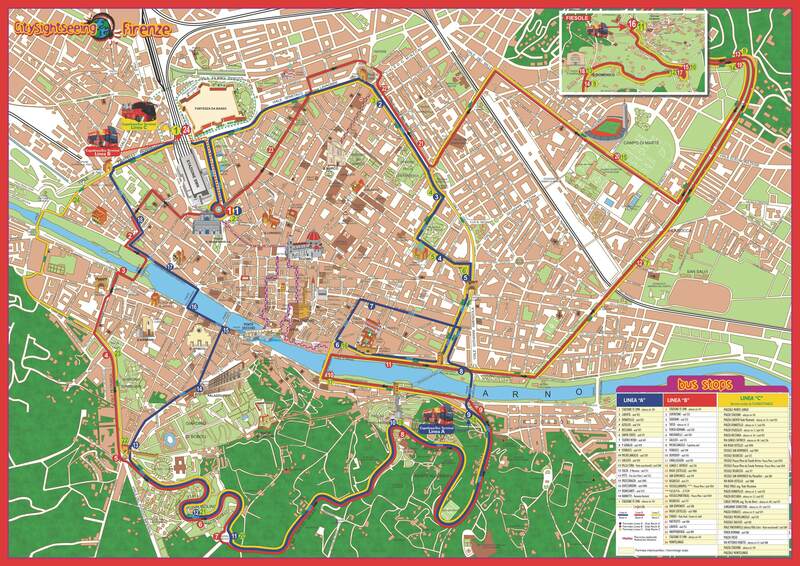 Line B (2 hours, 27 stops): Galileo, Machiavelli, Porta Romana, Tasso, Soderini, Curtatone, Vittorio Veneto, Shelly Cascine, Leopolda, Dogana, Liberta, Matteotti, Stadio, Ostello, San Dominico, Regresso, Fiesole, Lungo l'Affrico, Zecca Vecchia, Grazie, Demidoff, Ferrucci, Michelangelo. Unbiased comparison of Florence's Best City Passes /Discounts Cards(Firenze Card Vs Florence City Pass) based extensive research, Tripindicator team came up with comprehensive recommendations of Florence city passes for Family with kids, Couples and Single travelers which helps you choosing Best Florence City Pass suitable for your travel. Travelers Reviews about Florence Hop on Hop Off Bus Tour? This tour has overall positive reviews and average scores of 4.4 out of 5 on Get Your Guide and 4.5 out of 5 of TripAdvisor and Viator. Comments say that the service works well and is easy to use. Travellers like that there are 2 separate routes through the city. Refunds are available up to 24 hours in advance depending on your tour provider, cancellation fees may apply and some tickets are non-refundable. Wheelchair access is available for lower floor only. The Leonardo Da Vinci Museum – visit the exhibition devoted to one of the biggest geniuses in history and examine his groundbreaking devices, anatomical researches and works of art. Catch up with the Renaissance movement – see some of the biggest architectural masterpieces of Renaissance as you tour the city with the bus hop-on hop-off ticket that is valid up to two days. Get a comprehensive overview of Florence through a multilingual audio guide – listen to stories relating to the history, art and culture of the city of Florence in eight different languages. Travelers that used the combo ticket consider the purchase a good investment. They spoke highly about the cleanliness of the bus and the performance of drivers. They point out that buses are frequent and cover all must-see points of interest in the Renaissance city. Some of them experienced issues with the onboard Wi-Fi, but aside from this small downside, they agree that the combo ticket offers great value for money. The Uffizi Gallery – get an understanding of worldwide-famous Renaissance works of art on a guided tour and remain afterwards to study the collection of the gallery in detail. Tour masterpieces of Renaissance architecture during a bus tour – with the ticket that combines a visit to the Uffizi and a bus hop-on hop-off tour, see all the leading architectural examples of Florence, the birthplace of the Renaissance. Travelers that enjoyed the benefits of the combo ticket state that the purchase was a good investment for them. They learned interesting facts about the Uffizi Gallery and the city of Renaissance. They commend the passion and knowledge of the guides and find them very forthcoming. In general, holidaymakers that enjoyed sightseeing tours of Florence by bus had an excellent experience. They got an overview of the Renaissance city that helped them better organize their time and sightseeing during their stay. Most of them are satisfied with the punctuality and cleanliness of sightseeing buses and with the quality of information received on board. Travelers also have a great opinion about two different routes that allowed them to explore Florence more thoroughly.